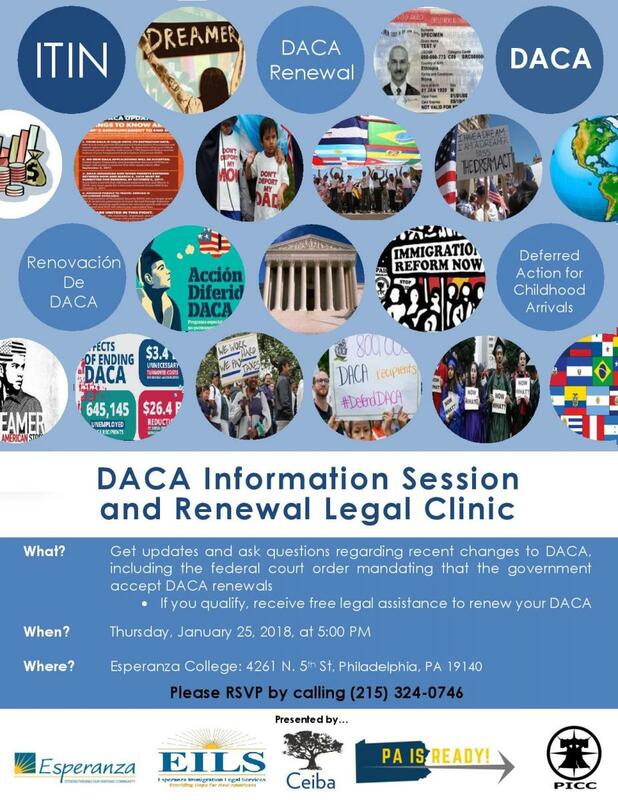 On Thursday, January 25th 2018, at 5 PM, Ceiba and Esperanza Immigration Legal Services (EILS) will organize an information session to update the community on the state of DACA following the California federal district court’s nationwide preliminary injunction that halts the administration’s efforts to end DACA. As a result of this preliminary injunction, USCIS issued a statement on January 13th, 2018 announcing that they will begin accepting DACA renewals. Accordingly, Ceiba and EILS will also assist individuals who are eligible to renew their benefits to complete their renewal applications at the session. “During this confusing time, it is important that the community fully understand what this injunction means for DACA recipients. We also encourage those who believe they are eligible for renewal to talk to an immigration attorney or DOJ accredited representative as soon as possible, as we do not know if or when the decision will be appealed.” said Maria Thomson, Legal Coordinator of Esperanza Immigration Legal Services. There will be immigration lawyers and accredited representatives at the Information Session to answer questions and help with renewal applications. “Under the current reality, the community must be vigilant in staying up-to-date on DACA and the proposed legislation surrounding it, as those changes have the potential to not only affect DACA recipients, but also the immigrant community as a whole,” expressed Taylor De La Pena, Ceiba Program Coordinator. At the information session, Ceiba and EILS will also share information regarding the proposed legislation surrounding DACA.